How can Renewables contribute to World Energy supplies? This will be a very large library. Most floors are still under construction. The NREL story covers most of the big issues. It is good to read the NREL story first as most of the recent work has not yet caught up with it anyway . 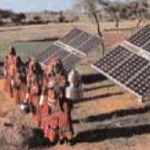 Renewable energy systems have been used for centuries and millennia. Dams, watermills and canals provided irrigation, cooling, grinding of cereals, and transport. Rooftop solar energy has long worked for heating water and is widely used today. Windmills have ground corn for centuries. Photoelectricity was first discovered by Heinrich Hertz in 1887, an effect which lead directly to quantum theory and is now the mechanism for solar panels. Modern renewables depend on 20th century electricity technologies and new materials to provide a far more efficient collection of wind and solar energy for use in the most flexible form, electricity. Nevertheless, the energy densities are low and huge areas of land or sea are needed to deploy them on a large scale. They are dependent on weather, climate, daily and seasonal cycles, are highly erratic, and are ill matched to usage profiles. This requires fast acting backup systems when they collectively fail to meet demand. The only options are fossil fuelled plants, the very source of global warming which we need to control. The Renewables Avenue therefore encompasses all energy systems which are not nuclear, though the layout is separated into Renewable and Fossil Fuel systems. All of the topics have become highly contentious, generating square miles of print and man years of TV and radio. In these libraries we do not attempt to follow confrontations, leaving that to External Links and the renewables Twitterings, but focus on the most technically proficient presentations and on major data sources from international companies and agencies. You have already been introduced to the most thorough analyses by the US NREL at the Renewables building and all the NREL Reports. The simple idea that windmills and solar panels can provide for our energy needs is replaced by the most complex energy system possible. If the facts change you should be willing to change your beliefs. Giving up beliefs is harder than giving up smoking. You are invited to make considered suggestions and contributions through Blogs or your own publications. Explore the options from the Renewables picLinks. The Islamic scroll background to Renewables Libraries reflects the ancient traditions of windmills, dams and water mills, and solar rooftop energy.